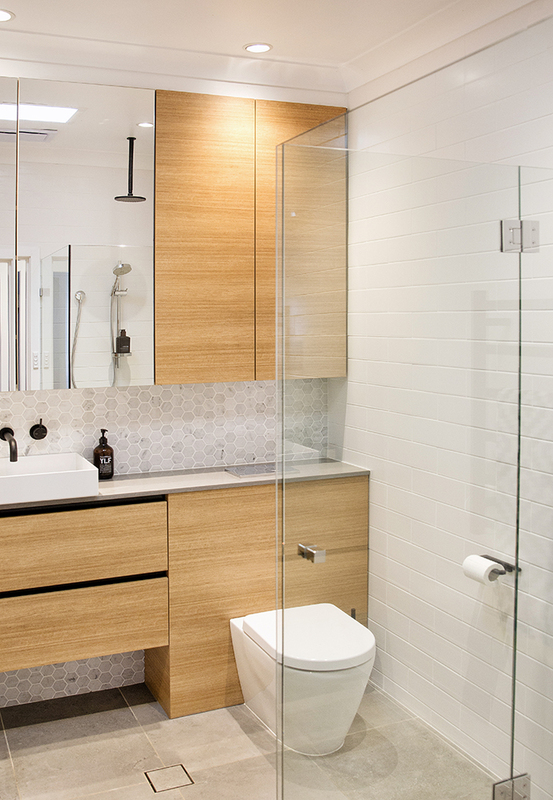 Before we came along, this little tired and run-down bathroom was crying out for a fresh new fitout. Our clients had discovered this quaint little home and immediately saw the adorable potential it might have with a bit of help. While the home would have been beautiful in its time it was after some much-needed rejuvenation. Luckily, they called us in to assist them in doing just that. 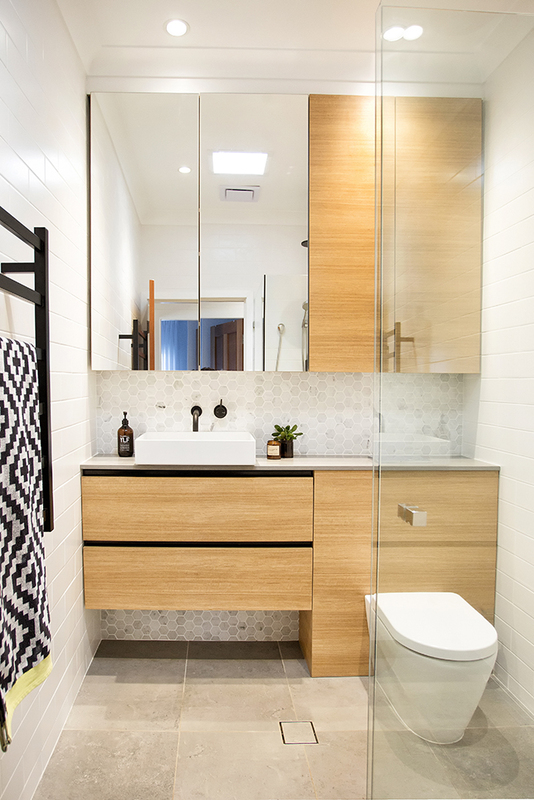 Initially, the bathroom was fitted out with an old vanity and toilet, rusting fittings and outdated tiles. It also featured a shallow built-in bathtub with the shower overhead – A tired design that can actually prove quite hazardous. It is not uncommon for people to slip and injure themselves in bath shower combinations such as these. Taking into consideration that our clients were after a space much more functional, we opted to remove the bath which they didn’t use. This allowed for us to replace it with a much larger frameless shower. By removing the bath and having the shower frameless the small space was opened up immensely and made the room feel much bigger and lighter in comparison. Next, we added some much-needed storage space by removing and filling in the old, frosted highlight window that originally took up the length of the back wall. On the other side of this window was an internal hallway so it didn’t serve a function. The materials and finishes of the bathroom were kept beautiful and sleek with uncompetitive tiles of similar light colourings selected. 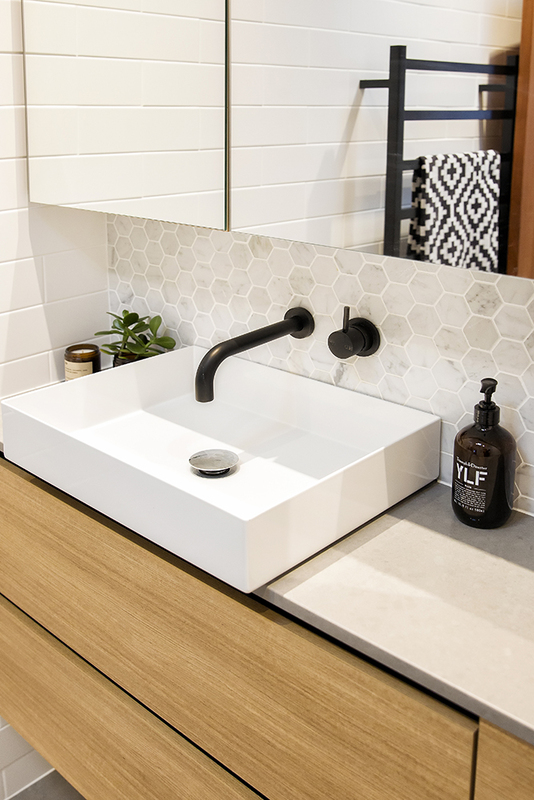 These complimented each other beautifully but exhibited varied shapes, sizing and textures that helped to create a clean, elegant look while still creating interest and diversity throughout the space. 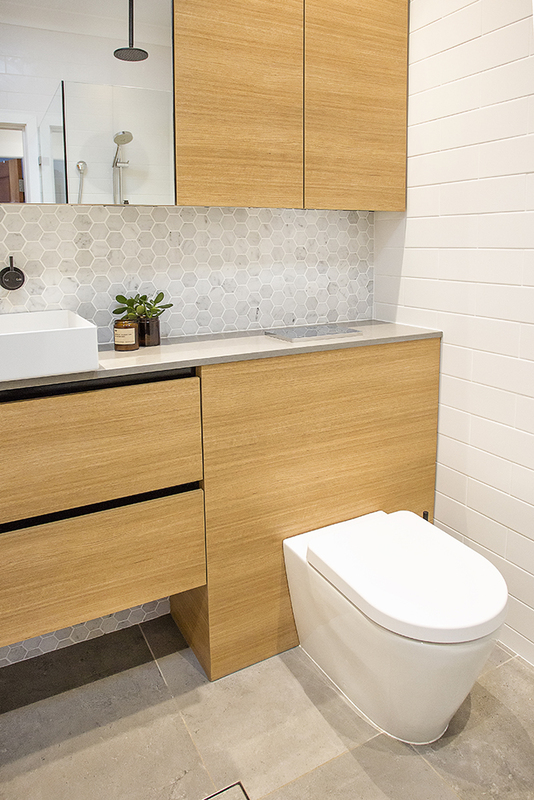 The light space was warmed up with the gorgeous textured timber look cabinet finish. 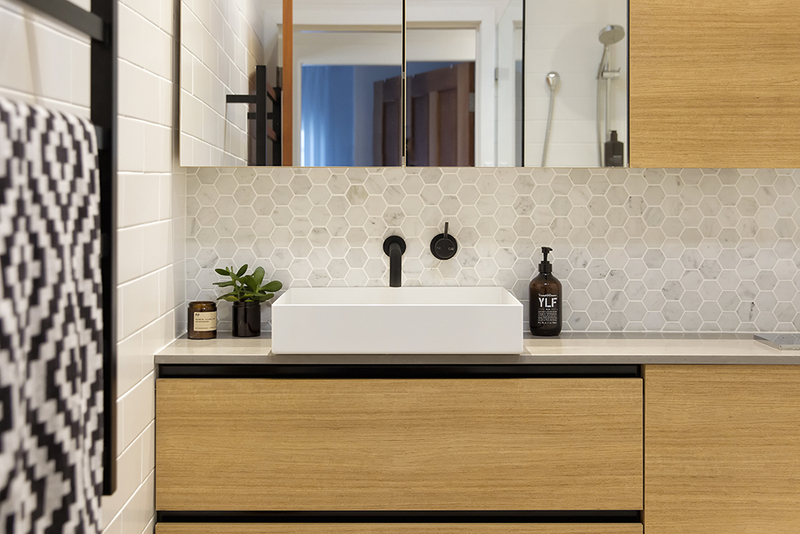 The horizontal timber grain runs along the full length of the vanity wall and elongates the space further creating a larger and sophisticated atmosphere. Aiming for sleek and minimal design we designed a space within the joinery to house the cistern for the new toilet pan installed. The design also allowed us to create much more bench space within the room and have the vanity run from wall to wall. 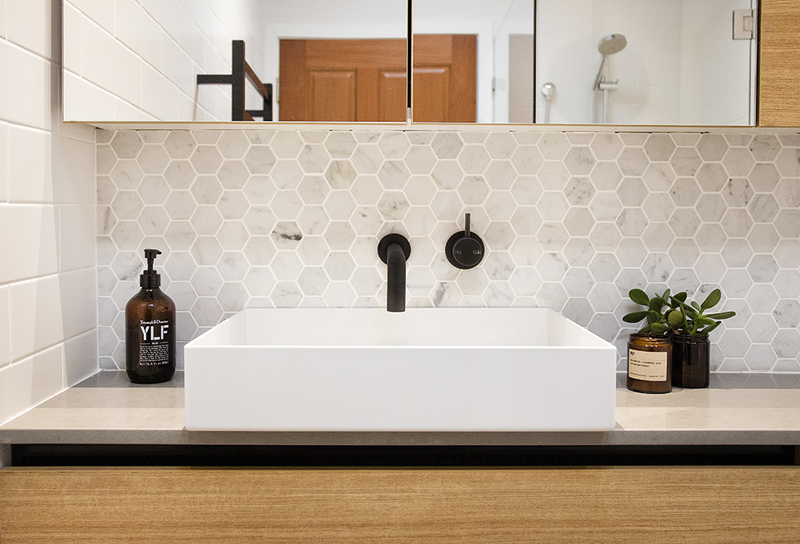 The whole space is finished off with a Sleek Concrete look benchtop paired with minimal elegant matt-black fittings and fixtures. We even included strips of the same finish inside of the vanity’s concealed handles! 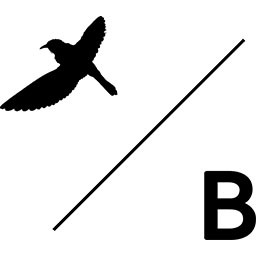 We are all about the details here at Birdblack Design and no detail is ever too big or too small. These concealed handles were supplied by Hafele, they finished off the entire space and truly refined the level of sophistication of this beautiful bathroom.